It can be confusing to determine what a seed bead looks like based on its description! Here are some commonly used terms (and some not-so-common) to help you along. Transparent beads are clear and tinted, and you can see through them. Light is visible through the beads. An AB (aurora borealis) finish is a rainbow effect on one side of the glass bead. Opaque beads are a solid color and do not allow light to pass through. Color Lined beads have a color lining of an transparent bead. The colors vary, including special color effects. The transparent bead may be crystal, or any other transparent color. Matte (or Frosted) beads have an etched look to them. Semi-matte beads have a mixed glossy/matte finish to them. They are a little brighter than regular matte finish beads. 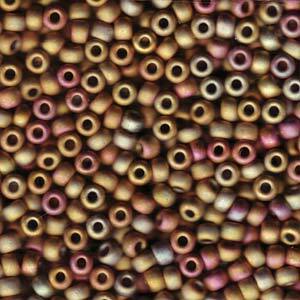 Metallic and Metallic Iris beads have a metallized finish. Sometimes, this finish rubs off. Use a clear fixative like Krylon spray. An Iris finish is a multicolor effect, which creates a rainbow type effect all around each bead, but also causes a range of color hues and tones within any mix. It appears to look like a drop of oil spilled in water. For example, Blue Iris is black with blue rainbow effect, but solid in color. A luster finish creates an irridescent shine around the bead. Lustered beads are rich, shiny, semi-transparent with a very high gloss. Galvanized beads have a coated finished applied to the glass through a galvanization process. This finish does come off, so we suggest you use a clear fixative, like Krylon spray. Ceylon beads have a pearlized finish. Sometimes the pearlized finish has been dyed to attain a particular color. Alabaster S/L Dyed beads started with a silver-lined translucent bead, and then dye the bead to a certain color. As with all dyed beads, use a clear fixative, like Krylon spray. Iridescent, another word for Aurora Borealis has a rainbow effect, usually transparent. Iris denotes a bead which is usually a dark color (almost black) with tinting of the color mentioned. Lined beads are clear on the outside, color in the inside. Opalescent beads have an opal-like effect in translucent materials. Opaque Charlottes, also known as “one cuts” are solid in color with occasional facets, usually a 13/0 bead, used in many higher quality Native American beadwork pieces. This type of bead is hard to come by in a variety of colors. Satin Glass beads are shimmering translucent glass that appears to to consist of fibers of different tones of the same color. carabee finish is a rich, opaque Iris (rainbow) coating, usually over a whole jet glass bead. Straited beads have swirls and streaks of other tones or colors within the body of the bead. Eye Beads – Not EVIL! Eye Beads - Not EVIL!